MikroTik provides GRE (Generic Routing Encapsulation) tunnel that is used to create a site to site VPN tunnel. GRE tunneling protocol which can encapsulate a wide variety of protocols creating a virtual point-to-point link was originally developed by Cisco. GRE is a stateless tunnel like EoIP and IPIP. That means if the remote end of the tunnel goes down, all traffic that was routed over the tunnels will get blackholed. To solve this problem, RouterOS have added ‘keepalive’ feature for GRE tunnels. By default keepalive is set to 10 seconds and 10 retries. GRE adds an outer header mentioning the entry point of the tunnel (SourceIP) and the exit point of the tunnel (DestinationIP) but the inner packet is kept unmodified. GRE tunnel only encapsulates IP packets but does not provide authentication and encryption. GRE tunnel with IPsec ensures IP packet encapsulation as well as authentication and encryption. IPsec usage makes your packets secure but it works slowly because of having extra authentication and encryption process. So, my opinion is that if data security is your concern, use GRE tunnel with IPsec but if data security is not so headache, use only MikroTik GRE tunnel because it works so faster. The goal of this article is to design a GRE VPN tunnel with IPsec. So, in this article I will show how to create a GRE tunnel with IPsec to establish a secure site to site VPN tunnel between two Routers. To configure a site to site GRE VPN Tunnel (with IPsec) between two MikroTik Routers, I am following a network diagram above. In this network, Office1 Router is connected to internet through ether1 interface having IP address 192.168.70.2/30. In your real network this IP address will be replaced with public IP address provided by your ISP. Office1 Router’s ether2 interface is connected to local network having IP network 10.10.11.0/24. After GRE tunnel configuration, an GRE tunnel interface will be created in Office 1 Router whose IP address will be assigned 172.22.22.1/30. Similarly, Office 2 Router is connected to internet through ether1 interface having IP address 192.168.80.2/30. In your real network this IP address will also be replaced with public IP address. Office 2 Router’s ether2 interface is connected to local network having IP network 10.10.12.0/24. After GRE tunnel configuration an GRE tunnel interface will also be created in Office 2 Router whose IP address will be assigned 172.22.22.2/30. We will configure a site to site GRE Tunnel between these two MikroTik Routers so that local network of these routers can communicate with each other through this VPN tunnel across public network. To configure a site to site GRE VPN between two Routers, I am using two MikroTik RouterOS v6.38.1. IP information that I am using for this network configuration are given below. This IP information is just for my RND purpose. Change this information according to your network requirements. We will now start our site to site GRE VPN configuration according to the above network diagram. Complete GRE configuration can be divided into four parts. Basic RouterOS configuration includes assigning WAN IP, LAN IP, DNS IP and Route, NAT configuration. According to our network diagram, we will now complete these topics in our two MikroTik RouterOS (Office 1 Router and Office 2 Router). The following steps will guide you how to perform basic configuration in your Office 1 RouterOS. Login to Office 1 RouterOS using winbox and go to IP > Addresses. In Address List window, click on PLUS SIGN (+). In New Address window, put WAN IP address (192.168.70.2/30) in Address input field and choose WAN interface (ether1) from Interface dropdown menu and click on Apply and OK button. Click on PLUS SIGN again and put LAN IP (10.10.11.1/24) in Address input field and choose LAN interface (ether2) from Interface dropdown menu and click on Apply and OK button. Go to IP > DNS and put DNS servers IP (8.8.8.8 or 8.8.4.4) in Servers input field and click on Apply and OK button. Go to IP > Firewall and click on NAT tab and then click on PLUS SIGN (+). Under General tab, choose srcnat from Chain dropdown menu and click on Action tab and then choose masquerade from Action dropdown menu. Click on Apply and OK button. Go to IP > Routes and click on PLUS SIGN (+). In New Route window, click on Gateway input field and put WAN Gateway address (192.168.70.1) in Gateway input field and click on Apply and OK button. The following steps will guide you how to perform basic configuration in your Office 2 RouterOS. Login to Office 2 RouterOS using winbox and go to IP > Addresses. In Address List window, click on PLUS SIGN (+). In New Address window, put WAN IP address (192.168.80.2/30) in Address input field and choose WAN interface (ether1) from Interface dropdown menu and click on Apply and OK button. Click on PLUS SIGN again and put LAN IP (10.10.12.1/24) in Address input field and choose LAN interface (ether2) from Interface dropdown menu and click on Apply and OK button. Go to IP > Routes and click on PLUS SIGN (+). In New Route window, click on Gateway input field and put WAN Gateway address (192.168.80.1) in Gateway input field and click on Apply and OK button. Basic RouterOS configuration has been completed in Office 2 Router. Now we are going to start EoIP tunnel configuration. After MikroTik Router basic configuration, we will now configure GRE tunnel with IPsec in both MikroTik RouterOS. In GRE tunnel configuration, we will specify local and remote IP address as well as shared secret for IPsec. 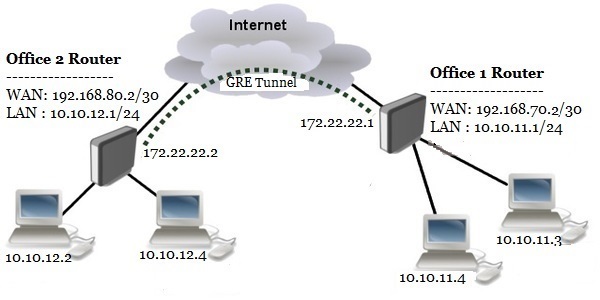 The following steps will show how to configure GRE tunnel in your Office 1 Router. Click on Interfaces menu item from Winbox and click on GRE Tunnel tab and then click on PLUS SIGN (+). New Interface window will appear. Put a meaningful GRE tunnel interface name (gre-tunnel-r1) in Name input field. Put Office 1 Router’s WAN IP address (192.168.70.2) in Local Address input field. Put Office 2 Router’s WAN IP address (192.168.80.2) in Remote Address input field. Put IPsec shared secret in IPsec Secret input field if your router supports IPsec and you wish to enable IPsec authentication and encryption. You should remember that this IPsec Secret must be same in both routers. Also uncheck Allow Fast Path checkbox if it is checked and you want to enable IPsec. You will find a new GRE tunnel interface followed by your given name (gre-tunnel-r1) has been created in Interface List window. GRE tunnel configuration in Office 1 Router has been completed. Now we will do the similar steps in our Office 2 Router to create GRE tunnel interface. The following steps will show how to configure GRE tunnel in your Office 2 Router. Put a meaningful GRE tunnel interface name (gre-tunnel-r2) in Name input field. Put Office 2 Router’s WAN IP address (192.168.80.2) in Local Address input field. Put Office 1 Routers WAN IP address (192.168.70.2) in Remote Address input field. You will find a new GRE tunnel interface followed by your given name (gre-tunnel-r2) has been created in Interface List window. GRE tunnel configuration in Office 2 Router has been completed. Now we will assign IP address in our newly created GRE tunnel interface in our both RouterOS so that both router can communicate with each other through this VPN tunnel interface. After GRE tunnel configuration, a new GRE tunnel interface has been created in both routers. So, if we assign same block IP in both interfaces, the both router will be able to communicate with each other through this EoIP tunnel. In this part, we will now assign IP address in our newly created tunnel interface. Go to IP > Address menu item and click on PLUS SIGN (+). Put a new private IP Block IP (172.22.22.1/30) in Address input field. Choose newly created tunnel interface (eoip-tunnel-r1) from Interface drop down menu. Assigning IP address on Office 1 Router’s tunnel interface has been completed. Similarly, we will now assign IP address on Office 2 Router’s tunnel interface. The following steps will show how to assign IP address in Office 2 Router’s tunnel interface. Put a new private IP Block IP (172.22.22.2/30) in Address input field. Choose newly created tunnel interface (eoip-tunnel-r2) from Interface drop down menu. Assigning IP address on Office 2 Router’s tunnel interface has been completed. In this stage both routers are now able to communicate with each other. But both routers’ LAN cannot communicate with each other without static routing configuration. So, in the next part we will configure static routing in our both Office Router. We will now configure static route in our both Office Router so that each router’s LAN can communicate with each other through GRE tunnel. The following steps will show how to configure static route in Office 1 Router. Go to IP > Routes and click on PLUS SIGN (+). New Route window will appear. In New Route window, put destination IP Block (10.10.12.0/24) in Dst. Address input field. Put the Gateway address (172.22.22.2) in Gateway input field. Static route configuration in Office 1 Router has been completed. Now we will configure static route in Office 2 Router. The following steps will show how to configure static route in Office 2 Router. In New Route window, put destination IP Block (10.10.11.0/24) in Dst. Address input field. Put the Gateway address (172.22.22.1) in Gateway input field. Static route configuration in Office 2 Router has been completed. Now both router as well as its LAN can communicate with each other through GRE tunnel across public network. To check your configuration, do a ping request from any router or any local network machine to other local network machine. If everything is OK, your ping request will be success. GRE VPN Tunnel Configuration with IPsec has been explained in this article. I hope you will be able to configure GRE tunnel with IPsec between your two office routers. However, if you face any confusion to configure GRE tunnel in your MikroTik Router, feel free to discuss in comment or contact me from Contact page. I will try my best to stay with you. Static Routing On MikroTik RouterOS. ← How To Configure MikroTik Site to Site EoIP Tunnel with IPsec.